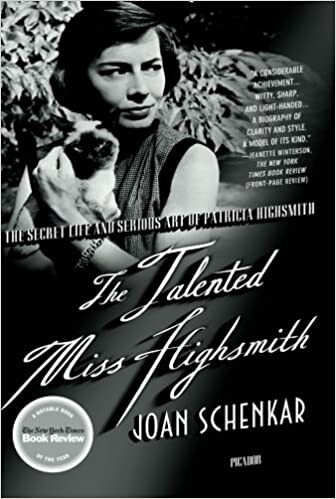 The Talented Miss Highsmith: The Secret Life and Serious Art of Patricia Highsmith – loudlatinlaughing – Euge! Euge! Exhausting. I’ve been wrestling with this book for a couple of weeks now and would have given up except the subject matter is too compelling. Because I’m high on Highsmith I suffered through the terribly constructed, bloated biography that Schenkar put together. That may be harsh criticism, but surely there was a way to chop the 600 pages into something more manageable. And nothing is more deflating than struggling through hundreds of pages of Pat’s tempestuous affairs with ladies (and a few men), looking up to see that you are in Part 14 of the section, Les Girls. I almost cried when I realized how much she’d packed into those pages. Did every single detail of every single affair she had need to be included? Ye gods. (Pat was a busy woman, frequently sleeping with several women at the same time, preferring love triangles or affairs with married women so there was no possibility of it continuing). The most interesting intel I got from this was Pat’s secret life as a comic strip writer. During the 1940s she was the “most consistently employed female scriptwriter in the Golden Age of American Comics,” and she continued to write them freelance while in Europe trying to make ends meet. Comics she wrote for include: Black Terror, Pyroman, Fighting Yank, The Destroyer, Sergeant Bill King, Jap Buster Johnson, The Human Torch, Crisco and Jasper, Real Life Comics, Spy Smasher, Captain Midnight, Golden Arrow. She hid this work from everyone, ashamed of it, but admitted later that it helped her tremendously in having to crank out huge quantities of pages around tight plot lines. This is also where she picked up the dual imagery she clung to in her own work, the alter-ego. The biographer goes on an interesting tangent about that era of comics and includes Gertrude Stein’s impression that Americans “do the best designing and use the best material in the cheapest thing.” Apparently Stein had Krazy Kat and The Katzenjammer Kids strips mailed to her in Paris, sharing them with equally obsessed comics fan Picasso. As a girl, Pat read obsessively and used books as “drugs”—sounds familiar—and later in life read the dictionary for half an hour each night (“As a novelist, I can say the dictionary is the most entertaining book I have ever read”). She kept snails as pets and would unleash them onto the dinner table to freak people out. An alcoholic, she shunned food and actually marked a line across the bottle for each day’s rations of booze (beer and gin or vodka in the morning, scotch for the remainder of the day). The author, Schenkar, claims: “Coffee, scientists now tell us gravely, helps to protect the livers of heavy drinkers from cirrhosis,” meaning that Pat was preserving herself by being a huge coffee drinker along with consuming astounding amounts of booze. She was also known to be furious if she was at a party that ran out of alcohol. She was obviously deeply into murder, and her last writer’s diary calculates that “one blow in anger [would] kill, probably, a child from aged two to eight. Those over eight would take two blows to kill.” What circumstances would drive her to this frenzy? “One situation—maybe one alone—could drive me to murder: family life, togetherness.” Amen, sister. Later she says “Families are nice to visit but I wouldn’t want to live with one.” Pat had a ridiculously complicated and fraught relationship with her mother Mary, having to cut off contact completely in later years after one too many screaming matches.